The Nissan Primera is a large Japanese hatchback designed with motorway and long distance driving in mind. The Primera boasts a modern style and generous specification. Rival brands will definitely get a run for their money. 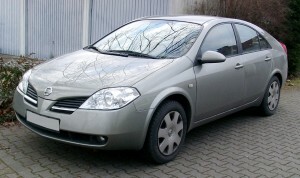 The Nissan Primera is a large hatchback with a unique body design. The car’s design features ensure that the car will not be mistaken for any other vehicle on the road. This large hatch seems very at home large stretches of motorway. It has great road manners and has been designed with long distance driving in mind. The car is very comfortable and handles well. The Ford Mondeo is one of the most popular cars in this segment, and so is the Vauxhall Vectra. The Primera is certainly well equipped and has a lot to offer buyers. The car is well made and affordable. It will be interesting to see if the Primera offers enough to lure British buyers away from their long-time favorites. Given Nissan’s reputation for reliability and the recent push toward producing higher quality cars they just might be able to compete in this sector. The Primera offers enough standard specification to warrant a closer look. The Primera offers good value for money and should enjoy low running and maintenance costs. The car delivers decent fuel economy and low insurance rates. The car’s boot is not tall, but it is deep. The boot is large enough to store quite a bit of shopping, a couple of suitcases, or other similarly sized items. Cabin space is adequate and most passengers should be able to ride comfortably. The car’s sat-nav system is easy to use and read, and so are the car’s other controls. The main controls and displays are logically placed and easy to get to. The car’s basic stereo functions have been duplicated on the car’s steering wheel. Engine and road noise have successfully been reduced, but they tend to get louder at motorway speeds.The seats are large and supportive, and road imperfections are dealt with rather well further enhancing comfort levels. Access to the car’s cabin is straightforward. The car’s large door apertures allow easy access with good head and legroom available all-round. This car would have been more difficult to park due to limited rear visibility if it weren’t for the car’s colour camera. The camera makes parking a lot easier. Base models don’t include the camera and can be a little difficult to reverse park. The Primera performs very well on the motorway, delivering a smooth, economical and enjoyable ride. Unfortunately, on regular roadways it doesn’t do as well. It delivers a decent ride, but is not even close to being exciting or powerful. This car could be used as a family’s primary vehicle. The cabin could easily accommodate two adults and small children in the back seats. For a larger family it may not be as comfortable or as practical. The boot is large enough to carry misc. family related items. The Primera is not likely to be appealing to first time car buyers. It is probably too large, and may prove to be very difficult for a novice driver to park. There are definitely better choices available. Nissan is famous for producing reliable and quality-built cars. The company’s image however revolves around their ability to produce bargain vehicles. It may take some time for the public to embrace them as anything else. The car comes equipped with an engine immobiliser, remote central locking and a security lamp indicator. S, SX and SE models get a basic anti-theft alarm system, while SVE and T-SPEC receive a Thatcham security system with internal sensors. The car is standard fitted with ABS, EBD, driver airbag, passenger airbag, side and curtain airbags, three-point seatbelt pretentioners, Isofix child seat mountings and child safety locks. The car’s standard stereo unit includes a six-speaker single-disc CD player/radio system. The system delivers good sound quality, and for the SX, SVE and T-SPEC models they get a six-disc changer, and various speaker and sub-woofer enhancements depending on the model. The car has an excellent satellite navigation system as well. The Primera looks best in black, blue, and grey. Even though this is the case most Primeras in the UK are silver. The interior is most flattering in black leather and has a really good quality feel. On motorways the Primera delivers exceptional performance and a very comfortable ride, but on the road the car’s performance is only adequate. For the most part the Primera delivers good value for money but only delivers a ho-hum performance on roadways. This entry was posted on Tuesday, January 8th, 2013 at 12:31 pm	and is filed under Uncategorized. You can follow any responses to this entry through the RSS 2.0 feed. Responses are currently closed, but you can trackback from your own site. InforSERB MOT and Service feature!